If you have a modern browser, you can click the photos on this page to bring up a larger version. 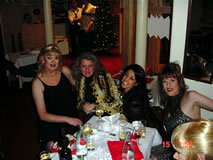 The annual Boudoir Xmas party has become one of the highlights of the year, and this year Jodie, Tracie and Nas had planned a meal at the Way Out Club restaurant, followed by a Karaoke. Well I can't say Nicola is the best singer in the world and most the miserable stuff I listen to would not be played at a Karaoke night, so it promised to be interesting. As usual I went and picked up Nas before driving over to the Boudoir and as usual Nas was not ready when I got there. When we arrive at the Boudoir 15 minutes late she blames me for driving too slowly. When we arrived at the Boudoir, the usual organised panic was in its full swing, with girls half made up and in various states of dress. However, within about 20 minutes normal service was resumed and the production line of make up, clothes then nails was in full swing. Eventually everyone was ready and after the obligatory photos we boarded our coach for the drive across London to the Way Out restaurant. Unfortunately on the way to the restaurant Jodie broke the news to us that the proposed Karaoke for the night had been cancelled, due to the organiser being taken ill at the last minute. I must admit to being slightly relieved at this news as I’m not sure the World is yet ready for Nicola Smith sings The Smiths. Upon reaching the restaurant there was a fine selection of food available including the traditional Turkey. I opted for the mushroom soup, followed by chicken in a mushroom sauce, which was followed by numerous glasses of red wine. After the main course had finished and the effects of the wine began to kick in the real fun began, with a constant relay back and forth to the toilets for a show and tell competition. In order to protect the innocent I cannot divulge the full details of what happened, but Jaynie a came out with a bigger reputation. The strangest thing was when Mel and Jackie reappeared from the toilets having swapped dresses. As it was so close to Xmas we had to wait a long time in the restaurant to get four cabs to take us onto the Way Out club. After the initial suggestion of walking to the club was rejected we sat down had a few more glasses of wine and Jaynie entertained us with a few songs. Eventually our 4 cabs arrived to whisk most of us off to the Way Out Club. Unfortunately Tess was suffering with a cold and decided to go home instead. When we arrived at the Way Out Club, a champagne reception had been arranged for us, so despite my reservations of mixing red wine and champagne I pitched in and did my bit in helping finish the three bottles of champagne. As we had arrived at the club so late there was not much chance of dancing after the champagne had been drunk, so after another round of compulsory pictures it was time to go home. The coach was waiting for us outside the club and it was a fairly quiet drive back to the Boudoir, where after a quick change it was back home at about 6am.